AUDIO DIY는 위험 부담을 알고 자신의 책임하에 제작, 개조 및 수리 등을 하는 것입니다. 어떠한 이유로도 교환 또는 반품이 되지 않으니 이점 양지하시기 바랍니다. It will drop directly into DIP8 single or dual footprints in a CD, DVD, Preamp or soundcard. It's based on brand new technology, which will provide world class sound performance in your existing product. Compared to other existing products this module is made with low inductance non magnetic components, and a special high-speed circuit with extremely low THD and TIM. Current mirrors are made with lowest noise LED references. Resulting in a clean and coherent sound experience, with complete 'black background'. This new OP-Amp module is drop-in compatible with NE5532, AD712, NJM2110, AD8620, MC4558, OP275, OPA2604 etc for duals and NE5534, AD711, AD8610, OPA604 etc for singles. With a reference Clock and a couple of voltage regulators this is the cheapest way to achieve true high-end sound performance, even from mid range audio equipment. 기존의 OPamp를 빼낸 후 Discrete Opamp를 방향에 맞게 소켓에 끼운다. OPamp를 뒤집어 보면 원형 홈이 보이는 쪽과 기판에 표시된 홈과 방향을 동일하게 맞추어 꼽으면 됩니다. * Special Edition: These have ultra stable resistors, a higher slew rate and are 3x faster giving improved resolution. 이 모듈은 CD Player나 DVD Player 또는 앰프의 업그레이드를 위해 개발된 것이다. 기존 OPAMP를 제거하고 그 자리에 설치하면 된다. 저렴하면서도 매우 효과적인 업그레이드 방법으로 하이엔드나 중급기종을 그 타켓으로 한다. 2010년 초 이 새로운 디스크리트 오피앰프가 소개되었다. 소스기기든 파워앰프든 대부분 핵심부품으로 증폭할 때나 Fltering, Audio Signal의 임피던스 조절등에 오피앰프를 사용한다. 이것은 오피앰프 개개의 특성이 오디오기기의 음질에 매우 큰 영향을 미친다는 것을 의미한다. 매우 좋은 데이터적 수치를 가진 예를 들면 초저 THD 스펙을 가진 오피앰프도 서로 매우 다른 음직적 특성을 가진다는 것이다. 이는 기술적인 스펙이 음질을 결정짓는 요소가 아니라는 것이다. 오디오용으로 괜찮다는 좀 특별한 오피앰프가 몇가지 있었다. 하지만 그 비싼 칩들이 CDP, DVDP, 프리앰프, 파워앰프등에 최고의 음질을 내어줄 수 있는 진짜 실력파인가에 대해 요즘 논쟁중이다. 대부분의 판매되는 오디오 플레이어들이 값싼 오피앰프를 사용하고 있다. 그 특별한 수백배나 더 비싼 오피앰프를 사용하고 있지 않기 때문에 거꾸로 음질의 개선효과는 충분하지 않을까? 디스크리트 오피앰프는 매주 직진성이 좋은 새로운 12 트랜지스터 회로를 기초로해서 만들어 졌다. 따라서 Low open loop 증폭이 가능하고 자연스럽고 매우 섬세하고 완벽한 음색배런스를 가진 편안한 사운드 이끌어 낸다. 이 회로는 Current mirror를 보여주는 초저 노이즈의 녹색 LED를 도입하고 있다. 이로써 앰프는 매우 낮은 노이즈 특성을 가지고 있다. 입력단은 시중에서 볼 수 있는 디스크리트 오피앰프와는 달리 무극성이다. 이는 실사용 조건하에서 최상의 안정성을 보여주고 또한 정전기에 대해서도 매우 안전하다. 무극성 트랜지스터는 또한 입력단에 FET를 사용한 것 보다 사운드를 맑고 더 다이나믹하게 한다. 삽입해서 쇼트가 생기지 않도록 하고 있다. 새로운 기술을 적용해 만들어진 이 모듈은 현 기기의 성능을 완전 업그레이드 시켜줄 것이다. 다른 유사 제품에 비해 이 모듈은 底인덕턴스 비자성 부품을 사용하고 매우 낮은 THD(0.0003%)를 가진 특수 고속회로를 사용하고 있다. Current mirror는 초저 Noise LED를 사용하고 있다. 따라서 사운드는 맑고 심지있고 매우 완전 암소음 제로의 배경을 들려준다. 이 Sony player에서는 모듈을 15분 이내 쉽게 장착할 수 있다. 개선되어 해상도와 투명도가 발군이 되었다. 이 새 오피앰프는 듀얼타입의 NE5532, AD712, NJM2110, AD8620, OP275, OPA2604등과 대체할 수 있고 싱글로는 NE5534, AD711, AD8610, OPA604등이 있다. 오디오용 클락과 레귤레이터와 함께 오피앰프는 가장 저렴하고 효율적인 기기의 업그레이드 방법이다. DX 디스크리트 오피앰프는 매우 빠르다. 이는 일반적으로 전원공급 레일에 디커플링 하는 것에 매우 유의해야 한다는 뜻이다. 따라서 일부 디커플링을 부실하게 해놓은 기기에 적용될 수 있도록 모듈에는 디커플링용 캡을 추가할 수 있도록 납땜부가 만들어져 있었다. 하지만 Low open loop gain 때문에 실사용 테스트에서는 매우 부실한 디커플링 조건에서도 오피앰프는 매우 안정적으로 동작한다. 모듈과 디커플링 캡 사이에 60Cm 까지의 선이 연결되어 있어도 여전히 안정적이었다. 이러한 결과로 차후 생산분 부터는 자체의 디커플링 캡을 제거하도록 했다. 이로서 8mm의 높이를 낮추는 결과를 얻게되었다. 물론 별도로 디커플링 캡을 추가하고 싶으면 마더보드 아래에 추가하면 된다. 디스크리트 오피앰프로 얼마나 업그레이드가 될까? Listening 테스트를 몇번 해봤는데, 먼저 100불짜리 중고 CDP를 신문에서 구입해서 1000불짜리 연구실기기와 5000불짜리 레퍼런스 기기와 비교해 보았다. 그리고 이 중고 100불짜리를 Dual type 2개를 사용하여 업그레이드를 했다. 전체 비용은 전부 200불 이하. 다시 비교 청취를 했다. 바로위 사진에 있는 오피앰프만 두 개 개조된 기기가 바로 그것이다. 테스트 결과 사운드퀄리티 측면에서의 업그레이드는 아래에 설명되어 있다. 이 100불짜리의 좋지 않던 음질이 업그레이드 이후 거의 5000불짜리 기기와 모든 면에서 근접해 있었다. 음질의 차이는 이 300불짜리 기기와 5000불짜리 하이엔드 모델과 거의 느낄 수 없는 수준이 된 것이다. 이 100불짜리 플레이어엔 오피앰프 개조외에는 클락조차도 달지 않았다. 만약 클락까지 단다면 분명 5000불자리 플레이어를 뛰어넘는 소리일 것이다. 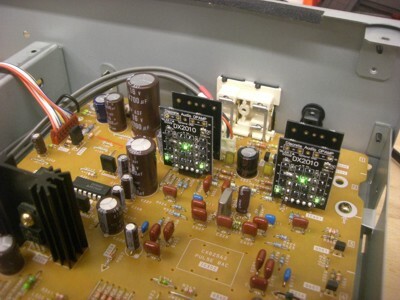 This module is intended as a way to upgrade your CD or DVD player or amplifier, by removing the existing OPAMP's and dropping these into the motherboard. It is a cheap, but very effective upgrade to sound quality, and can be performed on high-end as well as midrange models. 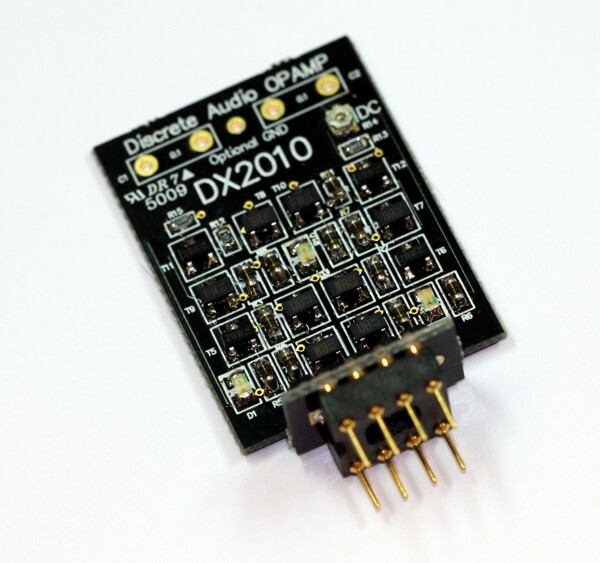 By start of 2010 we introduced these new discrete OPAMP's. Most signal sources, and many power amplifiers use operational amplifiers, as main active component, as amplifying, filtering and impedance conditioning of the audio signal. This means the audio properties of these OPAMPs have a powerful effect on the sound of your audio appliance. Even OPAMP's with good data, like very low THD specification still have very different sonic properties. This tells us that technical spec is not a defining factor for sound quality. Classically there has been a few IC OPAMP's considered good for Audio, and with golden qualities. But today it is in debate if even these very expensive chips are really capable of getting the best sound out of your CD player, DVD player, preamplifier or power amplifier. And when you add the fact that most commercial audio players use cheap OPAMP's and not the classical 'golden' OPAMP's that would cost hundreds of times more, there is place for improvement. This discrete OPAMP is based on a novel 12 transistor circuit with very high linearity. Therefore low open loop amplification is possible, leading to natural, relaxed sound with a very high detail and perfect tonal balance. The circuit implies current mirrors, which are here implemented with ulra low noise green LED's. This gives the amplifier very good low noise performance. 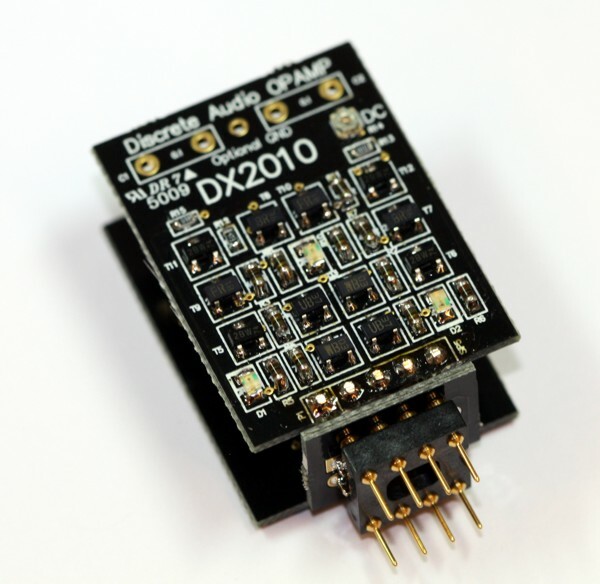 The input stage is bipolar unlike some other discrete OPAMP's available on the market. This gives our module the best possible stability under all real-life uses, and also protects it better against static electricity. Bipolar transistors also tend to sound cleaner and more dynamic than FET's in the input stage. 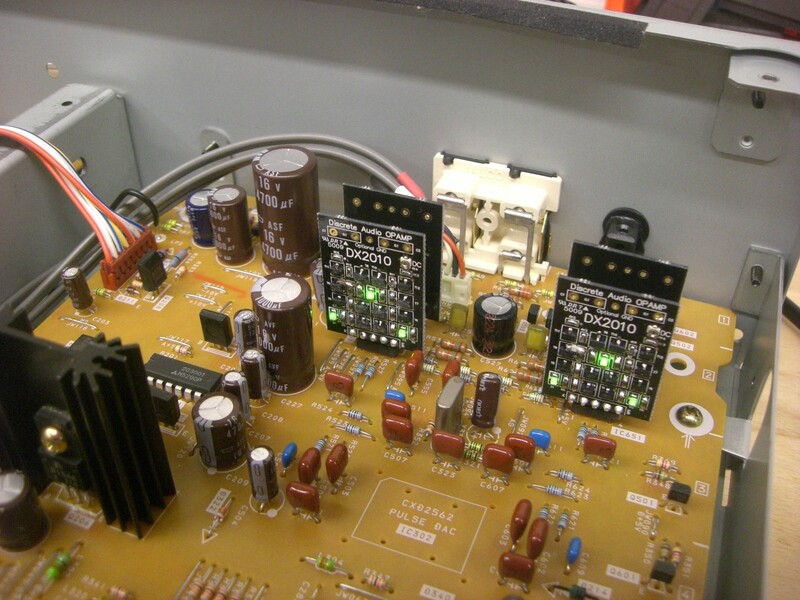 In line with our CD upgrade components we launched a high end discrete analog OP-Amp module in January 2010. It will drop directly into DIP8 single or dual footprints in a CD, DVD, Preamp or soundcard. It's based on brand new technology, which will provide world class sound performance in your existing product. Compared to other existing products this module is made with low inductance non magnetic components, and a special high-speed circuit with extremely low THD (0.0003%). Current mirrors are made with lowest noise LED references. Resulting in a clean and coherent sound experience, with complete 'black background'. only a midrange CD player. This new OP-Amp module is drop-in compatible with NE5532, AD712, NJM2110, AD8620, MC4558, OP275, OPA2604 etc for duals and NE5534, AD711, AD8610, OPA604 etc. for singles. The DX discrete OPAMP is extremely fast, and this normally means you have to be very careful with decoupling the supply rails. Therefore we placed pads for mounting optional decoupling caps on the module itself, in case some CD players had poor decoupling on the motherboard. However our real life tests now show, that because of the relative low open loop gain, the OPAMP is stable even with very poor decoupling. With up to 60 cm of wire between the module and the nearest decoupling cap, it's still stable. That lead us to a decision to remove the local decoupling caps in the next production batch, in order to free up 8mm of space on height above the motherboard. Should you wish to add local decoupling caps, this is still possible by placing them under the motherboard. Just how effective is an upgrade with these discrete OPAMPS? We did some listening tests, we bought a 100 $ used CD player from the newspaper, and listened to it, compared it with our lab 1000 $ reasonably new CD player, and also a brand new 5000 $ reference player. Then we upgraded the 100 $ CD player with 2 dual OPAMP modules (total cost less than 200 $), and then compared again. 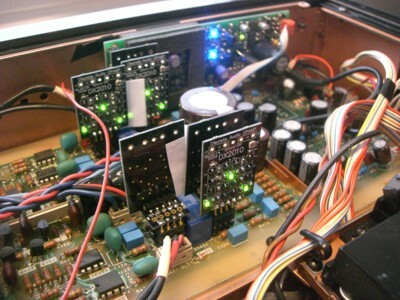 The 100 $ player upgarded is what you see on the photo above, with only 2 OPAMP's mounted. The results of the upgrade in terms of sound quality is shown below. The 100 $ player went from being the worst sounding source, to getting pretty close to the 5000 $ player in every aspect. The difference in sound quality was hardly noticable from the now 300 $ player up to the 5000 $ brand new high-end model. We did not upgrade the 100 $ player with a clock as well, but if we had done that it would most probably sound even better than the 5000 $ player, as it was already getting pretty close with just the OPAMP's.